It’s that time of year again! To help you keep the kids occupied in the exciting run up to christmas, we have compiled our top 5 festive science experiments! Make a delicious treat whilst exploring changing state from solid to liquid and back again! Mix the icing sugar, condensed milk and a few drops of peppermint extract until smooth. You can use a spoon, but it is more fun to knead it with your hands! Roll out the ‘dough’ , it can be as thick or thin as you want, and use biscuit cutters to shape your peppermint creams. Leave for a few hours until hard. 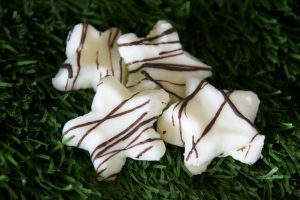 Melt the chocolate (an adult may need to assist with this) and drizzle over the peppermint creams, watch how the chocolate hardens! When you heat the chocolate, it provides the particles with energy and makes them vibrate and then break apart, which is why the chocolate changes from a solid to a liquid when melted. When it begins to cool, the bonds between the particles reform and it becomes a solid again. Thanks to Science Sparks for this tasty experiment! 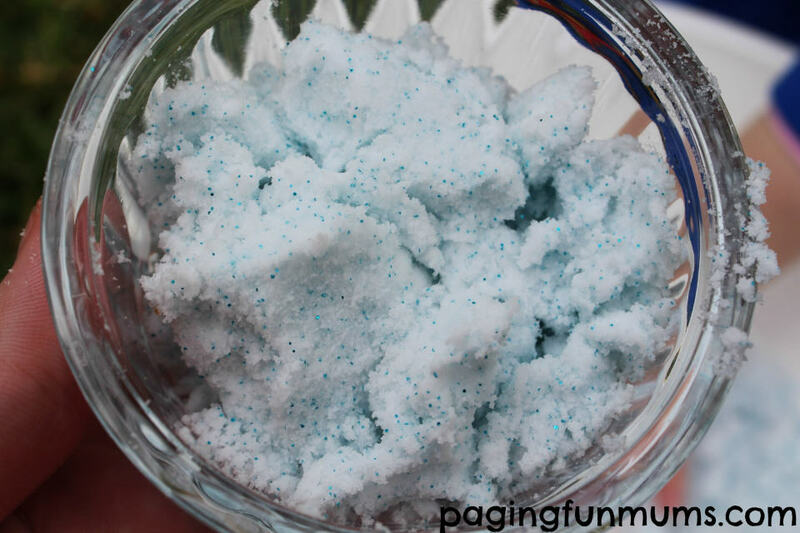 Make your own mini snow storm with this fun, simple experiment that you can do over and over again! Alka Seltzer or effervescent vitamin tablets. Fill the glass 3/4 full with oil. In a jug, mix warm water and white paint until the water is white. Pour the water/paint mix into the glass with the oil until the glass is almost full. Wait for the water and glitter to settle at the bottom. Break one of the tablets into pieces. Drop a piece of tablet into the jar and watch! Because water is more dense than oil, they don’t mix and that is also why the water sinks to the bottom, underneath the oil. When the tablet comes into contact with the water a chemical reaction occurs which makes carbon dioxide, which is why it makes bubbles. These bubbles and trying to escape which is why they move upwards, taking some of the water, paint and glitter with it! Thanks to Growing a Jewelled Rose for this experiment! 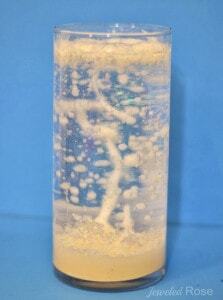 If you loved the snow storm in a jar, why not delve even deeper and make your own snowflake! These make great tree decorations, whilst learning about how snowflakes form! 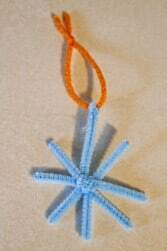 Make a simple snowflake using the pipe cleaners, leaving one ‘branch’ slightly longer. Make a loop using the string and bend the end of the longer pipe cleaner through the loop. Put the pencil through the loop and suspend the snowflake in the jar, with the pencil resting on top, this ensures the snowflake doesn’t touch the bottom or side of the jar. Make a mark on the jar so you know how much solution you will need to add to the jar to cover the snowflake. *Adult needed* Add 3 cups of boiling water to a jug and add 3 tablespoons of sugar for each cup of water, stirring between each tablespoon. Remove the snowflake, add the solution to the jar, then reinsert the snowflake. Leave the jar for a few days. Remove the Snowflake from the jar and leave it to try on a paper towel. 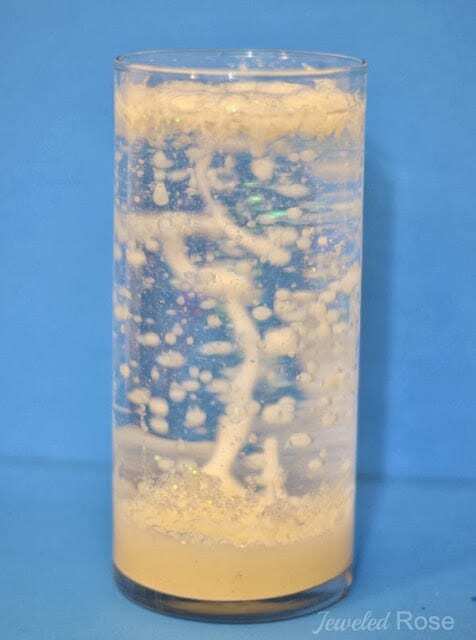 The crystals form by something called ‘nucleation’ , the sugar molecules stick to the pipe cleaners and, as more molecules stick, crystals start to form. 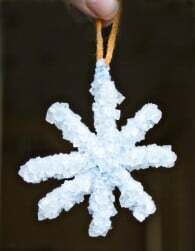 Note: If you don’t want to wait days for your snowflakes, you can use borax instead of sugar, however it is harder to buy (you will probably have to order it online) and should never be ingested. With borax the snowflakes will form in only a few hours. Thanks to Blissfully Domestic for this experiment! 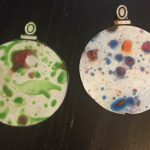 Put some Fun Science in your christmas tree this year with these easy and scientific christmas chromotography! Cut shapes out of the filter paper, be as christmassy as you want! simple circles are the easiest and make great baubles. Put the filter paper on top of the cup so that it is not touching a surface. Drop a few drops of water onto the middle of the paper and watch what happens! 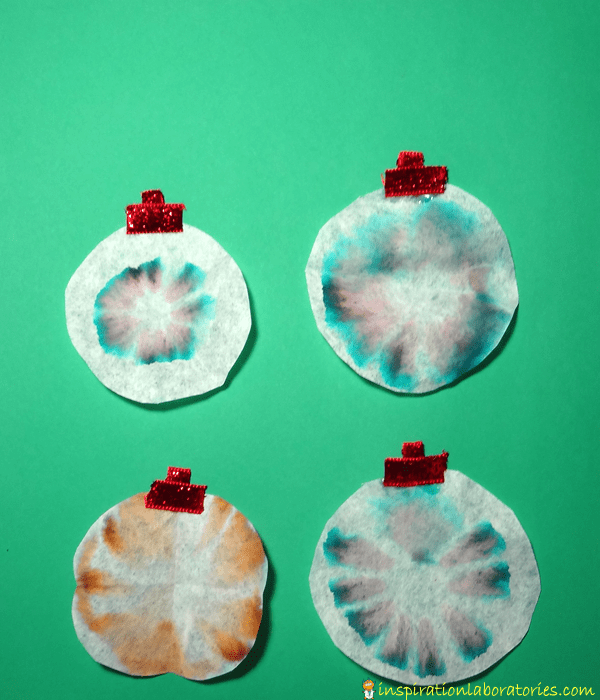 Turn your filter paper into ornaments by adding string, or ribbon etc. The water moves through the paper by capillary action and when it meets the ink it dissolves it, the ink then travels with the water and separates into its different components, as colours inks are usually made of several different colours. Thanks to Inspiration Laboratories for this experiment! We love getting messy and so do most kids! This erupting snow experiment is great to get stuck into whilst getting into the festive mood! 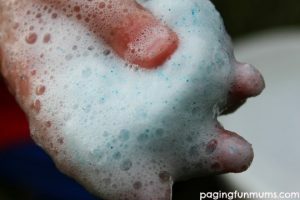 Add the shaving foam until you have a good, snowy consistency. Add some glitter and stir. The next part is up to you, you can leave it as it is in the bowl, or you can have a play with it! Can you make a snowman? Bicarbonate of soda is an alkali, and vinegar is an acid. Acids and alkalis are opposites and when you mix them it causes a chemical reaction which creates carbon dioxide bubbles that all try to rush to the surface at once, which is why the ‘snow’ bubbles! Thanks to Paging Fun Mums for this bubbly experiment! Arty Science - Festive Marbling!